图1. 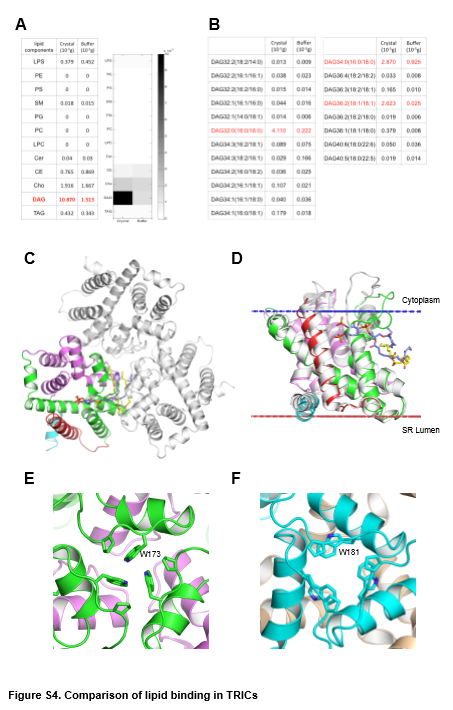 Llipid binding in the lateral fenestration. (A) Ribbon drawing of the GgTRIC-A, with one protomer removed. The TM2 and TM5 helices from two protomers are colored purple and green, respectively. The lipid molecules within the lateral fenestrations are shown as stick, with carbon, nitrogen, and oxygen atoms colored yellow, blue, and red, respectively. (B) Cross-section view of GgTRIC-A. Three DAG molecules were superimposed into the lateral fenestrations, with one lipid covered by the 2Fo-Fc electron density map, contoured at 2.0σ, and colored as inA. ( C) Close-up view of the lipid molecule, as in B. (A) Lipidomics analysis of GgTRIC-A crystals. The lipid components in GgTRIC-A crystals are shown in the table and the heat-map (buffer as control). The enrichment of DAG is highlighted, as seen red in the table and black in the heat-map. LPS, lipopolysaccharides; PE, phosphatidylethanolamines; PS, phosphatidylserines; SM, sphingomyelins; PG, phosphatidylglycerols; PC, phosphatidylcholines; LPC, lysophosphatidylcholine; Cer, ceramide; CE, cholesteryl esters; Cho, cholesterols, DAG, diacylglycerol; TAG, triacylglycerol. 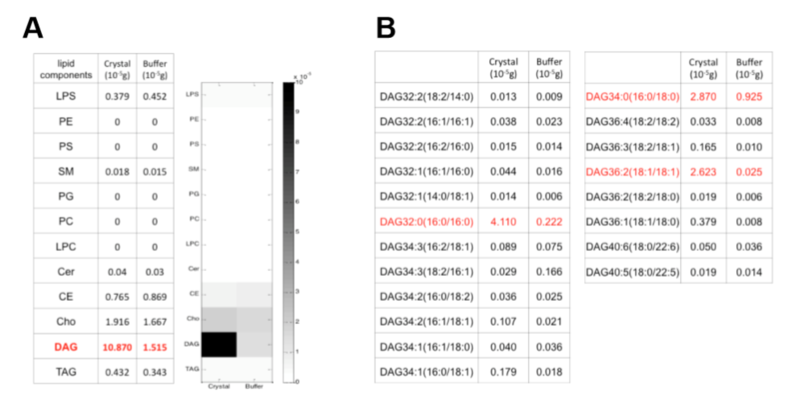 (B) Variants of DAGs are detected in the crystals. The most abundant DAG candidates are highlighted in red. (C) Comparison of lipid binding mode in TRICs. Ribbon drawing of the GgTRIC-A trimmer, with one protomer coloured as in Fig. S2d. The DAG molecules are shown as stick, and colored in yellow. Whereas the PIP2 molecules observed in CeTRIC-2 was modeled into the GgTRIC-A through superimposed of TRICs structural model, and colored in blue. (D) Superimposition of DAG-bound GgTRIC-A and PIP2-bound CeTRIC-2. Ribbon drawings are shown for both GgTRIC-A and CeTRIC-2, with GgTRIC-A coloured as in (C), and CeTRIC-2 in grey. The DAG and PIP2 molecules are shown, as in (C). (E) Close-up views of the conformation of conserved W173 in the GgTRIC-A trimer. (F) Close-up views of the conformation of conserved W181 in the CeTRIC-2 trimer.